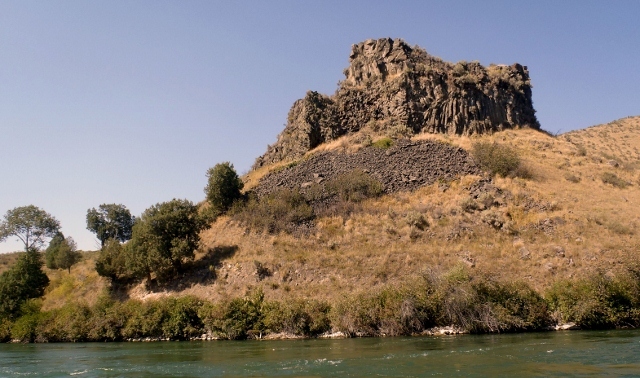 Chadd VanZanten sent us a tale about a day on the Snake River in Idaho that captures more than just the fishing. We like! 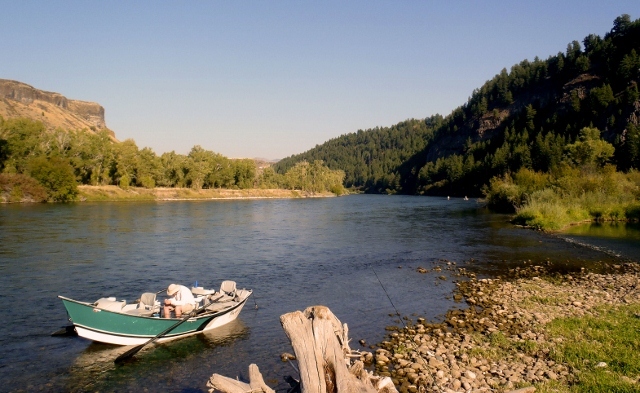 We decide on the Canyon Section of the Snake River just above Palisades Reservoir because it’s twenty-five miles long and it will take all day to fish and then some. That’s what we want—all day and then some. “I’ll go anywhere,” says Russ. “I’m bringing a head lamp,” says Ken. It’s a little after 8 a.m. when we arrive at the put-in. A river guide is putting in a drift boat ahead of us. He’s got two old guys as paying customers. The short one has a white, pencil-thin moustache and a rumpled ballcap. 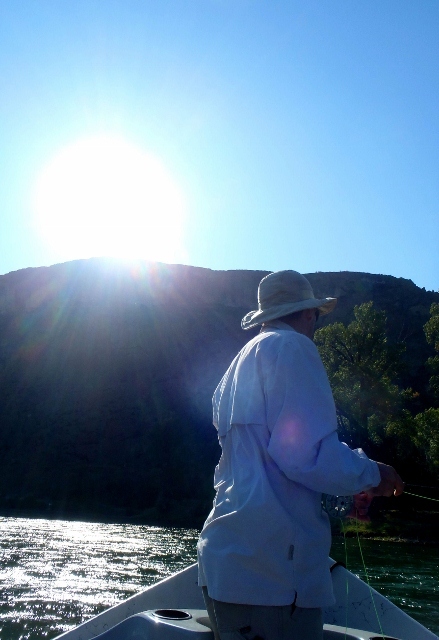 The tall one wears enormous sunglasses and an old-school fishing hat. He talks continuously, cracking wise with us while we wait. My knowledge of the Snake is limited, so I try to peek at the flies the two old guys have on their lines, but they’re holding their rods with their hands over the hook keepers, as if hiding them. “So, what’s the fly of the day?” I ask. They look to their guide, who frowns and shakes his head. The guy in the fishing hat shrugs and keeps talking as he clambers into the boat. He wishes us good luck and we hear him prattle on as they drift out of earshot. The day advances clear and warm, and there is almost no wind. As we slide downstream, towering cottonwoods and jutting formations of basalt loom against the blue sky. 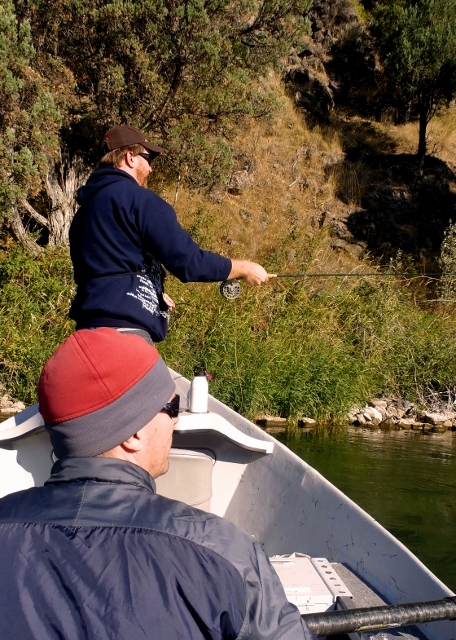 With our 6-weights we cast big terrestrials close in to the banks, where there are rainbows, browns, and cutthroats waiting beneath the overhanging grass and branches. Now and then we anchor up on vast gravel bars, where we snack and wet-wade. Ken rows most of the time but I take a couple turns. Two blisters develop on my right hand. There’s one from casting and one from rowing, meaning I have a lot to learn about both pursuits. “I have a blister and my blister has a blister,” he says, picking at his palm. Ken tries to coach us and fish at the same time. He’s more successful at the former than the latter. He teaches us about pillows, sweepers, standing waves. He explains how some currents push you away while others pull you in. We near the end of the Canyon Section. The sun drops out of sight, and the Snake lies in blue shadow. I’m still on the oars, and I’m beginning to think I’m not half bad, but then I almost miss the entrance to the take-out. When I finally get us paddled in, I nearly clunk into another fellow’s drift boat, which would be only slightly less insulting than feeling up his wife. Ken kibitzes patiently at me until I somehow collide with the floating dock at the take-out. Even then I bring us in at a weird angle, so when Ken jumps out he barks his shin on the gunwale. We help Ken trailer up his boat and we all get in the truck. In the dark we drive to a bar where the river guides hang out. The parking lot is full of trucks and drift boats and not much else. We speculate on how many fights have likely gone down there. “Technically, I don’t think we’re done here until one of us gets a couple teeth knocked out,” I joke. 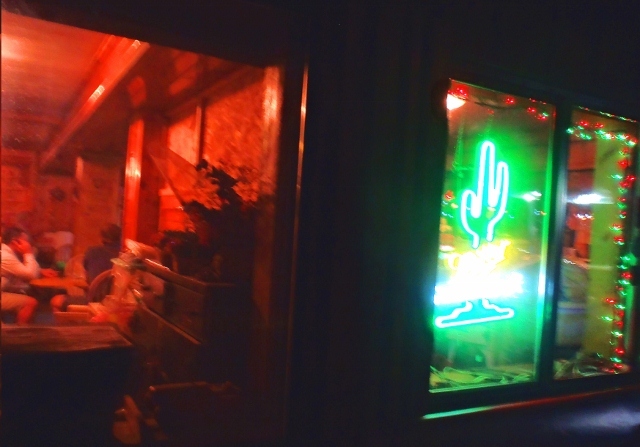 Inside, the place is noisy with grizzled, dark-tanned guys in ball caps and sun visors. They mill at the bar and holler for more beer. On the wood panelled walls hang dusty creels and fly rods. A petite blonde waitress of about thirty races around like a gerbil. “Steve, I told you I’ll bring you another one when I come back around,” she snaps over her shoulder as she zooms past. Steve replies with something mildly suggestive. She also tells us the kitchen is no longer serving chicken sandwiches, nachos, tacos, or mussels. Why anyone would come to a place like this to eat tacos and mussels is not explained. We order some burgers. As we wait for our food, I feel disconnected, as though I am in two places at once. It is not a wholly unpleasant condition, but at that moment I cannot put a name to it. Russ does it for me. “I feel like we’re still on the water,” he observes, running an uneasy hand over his face. That’s what it is. When I close my eyes, I’m still rocking and bobbing in the boat. “Well, we were floating for almost twelve hours,” says Ken. We nod and rub our eyes. Even in the high-tech fibreglass drift boat we are terrestrials adrift, and the current pulls at us long after we walk up onto land. There were shorter river sections we might have floated, but we chose the Canyon Section because it’s twenty-five miles of river and we knew it would take a long time. That’s what we came in search of—time. We found a single moment between what had passed and what was to come, and the river did the rest.